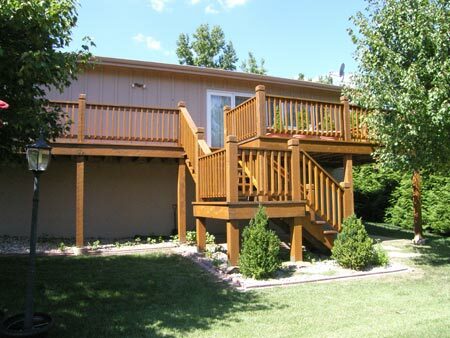 Missouri’s cold winters and hot summers can damage your deck if it is not maintained. Whether you have a wood or composite (Trex) deck, maintaining it every year is important to protecting your investment. Wood decks must be cleaned and stained throughout their lifetime to minimize serious damage such as graying, splintering, cracking, cupping, and rotting. Cleaning your deck and restoring its appearance is a delicate process, and using too much pressure or the wrong type of cleaner can do permanent damage. Our staff has undergone professional training and certification for deck work, and employs a four-step, low-pressure process that includes cleaning, brightening, neutralizing the pH in the wood*, and a final rinse to removal any residual dirt or chemicals. When you hire Shepherd’s Company, you’re hiring a name that has been trusted for over 30 years- we know how to properly clean your deck and stain it, keeping it looking like new for months to come. Shepherd’s Company also has extensive experience dealing with keeping water from damaging your deck. Find out more about our experience with a range of waterproofing services available..
Before we apply sealant and stain, we recommend that your house’s deck is thoroughly cleaned. This will remove any mold, mildew, algae, dirt and/or wood weathering that has accumulated over time. By pressure washing the deck of your home beforehand, you can be guarantee maximum adhesion of the stain and sealant to the wood deck. 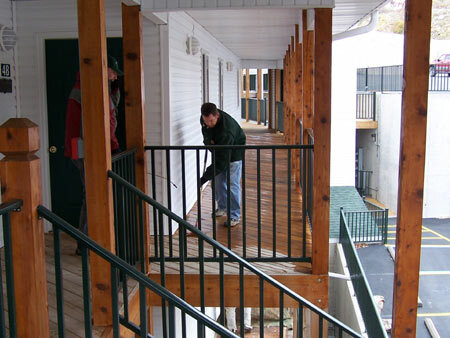 Wood restoration: Restore the beauty of your wood deck. When sealant and stain are applied, it is crucial that it is done with care and attention to detail. We can use a double-coat (“wet on wet”) approach to give you the right look, hand-brush “detail sections” such as spindles or stair rails, or employ strip/spray/applicate methods, as needed or desired. When proceeding with deck restoration and deck staining, we will cover surrounding areas, determine what furniture needs to be moved, and assess the right method for the type of deck or wood you have. *Note: Neutralizing the pH is a necessity to prevent premature failure of the stain. 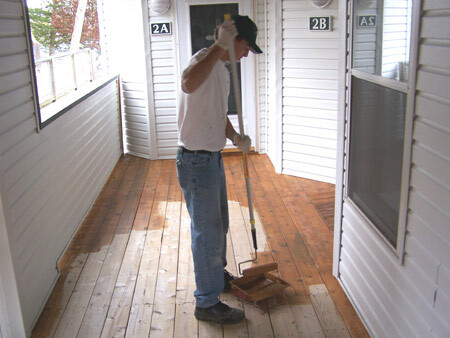 This process is often overlooked, but is key to achieving a uniform, long-lasting preservation of the deck.